Here is the nearly final model. Click on the picture for full screen version. I will work on the hands tomorrow.I am still not entirely happy about the junction between the chin and the cheek bone, the eye/nose area also need a bit more work but that should be enough for the Autorig tutorial. Here is a video showing the modeling process for my tribute to Pixar’s “Up”. You can double click to see the video in Full screen but if you first click on the Vimeo logo you will be able to see it in full 1600×1200. You might also be able to download the video from Vimeo, it is in Xvid/Divx, sorry I don’t have Quicktime pro but Virtual Dub or KMplayer allow you to go frame by frame if needed. “Waking Sleeping Beauty is no fairytale. It is a story of clashing egos, out of control budgets, escalating tensions and one of the most extraordinary creative periods in animation history. Director Don Hahn and producer Peter Schneider, key players at Walt Disney Studios Feature Animation department during the mid1980s, offer a behind-the-magic glimpse of the turbulent times the Animation Studio was going through and the staggering output of hits that followed over the next ten years. Artists polarized between the hungry young innovators and the old guard who refused to relinquish control, mounting tensions due to a string of box office flops, and warring studio heads create the backdrop for this fascinating story told with a unique and candid perspective from those that were there. You are in the train and your agent is calling you about that unknown company looking for animators. You quickly type their name in Google and oh … horror… they only have a Flash website. No worries Skyfire is fully Flash enabled! You get the number, phone your agent back and arrange an interview! Life is good. TCPMP wasn’t working very well on my HTC HD1 and I was using Divx Winmo player instead but Netdrg repackaged the free Divx/xvid player especially for the HD2 and that release rocks! One click on the screen and you go full screen in the glorious 480×800 HD2 resolution. Last Windows Mobile post of the day. I have considered buying an Iphone in the past but too many missing Windows default features made me buy a Windows Mobile phone instead. Some of those missing features are the full support and synchronisation of Outlook Notes and Calendar but more than anything is the lack of stable and well thought GTD application, fully integrated with Outlook. Pocket Informant is that one. David Allen wrote a very good book about GTD and I don’t intend to rival with it in few lines. 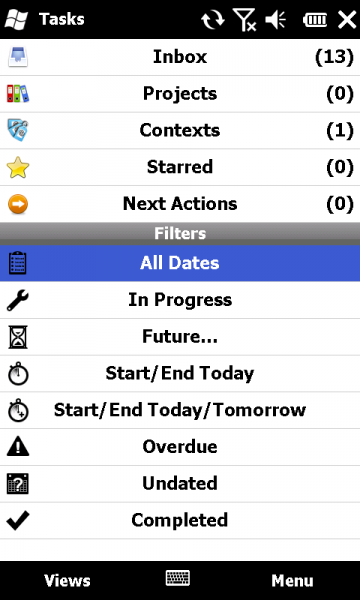 The only thing I will say is that if you are into GTD, Pocket Informant is a must! The software is huge but you shouldn’t have too much trouble operating it. There is also a free demo so give it a try and start filling up that Inbox and Next Action folder! Slide2Unlock is my second, well my first favourite Windows Mobile application. That one is a Windows mobile lock screen on steroids and believe it or not….. IT IS FREE!!!! On the surface it looks like an obvious Iphone lock screen rip-off but once you open the configuration panel, you realize that the software is an actual Power App that could be charged several dollars! Not only it allows you to preview your text messages and email without unlocking the phone, it also allows you to display your appointments on the lock screen….. How cool is that?!?! No need to slide, unlock, launch any application, no need of any Jail breaking, all the necessary information is all there, right in front of you! Your phone has now become a true productivity tool. Ah I forgot to mention something. There are hundreds of parametres you can play with but the best of all is once again the automatic trigger. 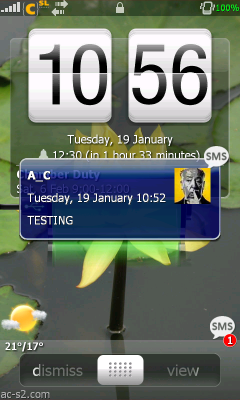 I have set mine to the best Windows mobile GTD application: Pocket informant. but that one needs an other post. 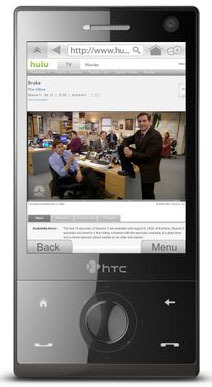 I was supposed to write a long post about my new HTC HD2 but I feel that I need a bit more time to fully realise how wonderful that piece of hardware is. I still need to talk about some great softwares available for it and one of those is G-Alarm. 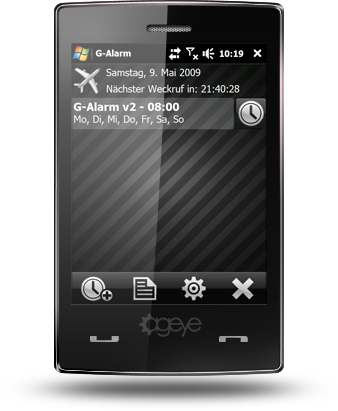 G-Alarm is a really cool alarm app that should immediately win your hearth within the 10 days of the free trial. For the price of two Lattés, you get a very convenient replacement for your probably ageing Alarm Clock Radio and since I have started using G-alarm, I have said good bye to my trusty 15 years old Sony “Dream machine” and so will you. G-Alarm does a lot of cool things as you probably saw on their website. Mp3, Talking clock. tilt sensor support, Maze and other brain wakening games, but the only function that made it worth those 5 euros to me, was the fact that you can trigger any application and wake the phone up at the specified time, switching from Airplane to Mobile mode. Since I am a great fan of Radio4 in the morning and I like to emerge from my sleep while listening to the news, the only thing I had to do was to make G-Alarm start the FMRadio.exe application! There are so many short film coming out all the time and I have so little free time that I tend to miss on a lot of little gems especially when the provided screenshot doesn’t do justice to the work. “La dama y la muerte” (The lady and the reaper) is one of those short films I would have missed if my friend Dan didn’t tell me about it. 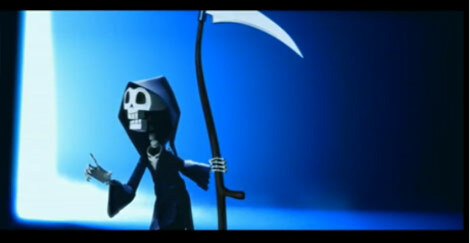 I love the design of the characters especially “La muerte”, the wacky layout and storyboard, the cartoony animation, the lighting. This reminded me a lot of the wackiness in “The emperor’s new groove” which is a very good thing.